While walking about the yard this morning, there are areas that I can see where the deer have gone. Along the edge of the spruce grove, there are now several areas like this. This patch is new. It wasn’t there yesterday. 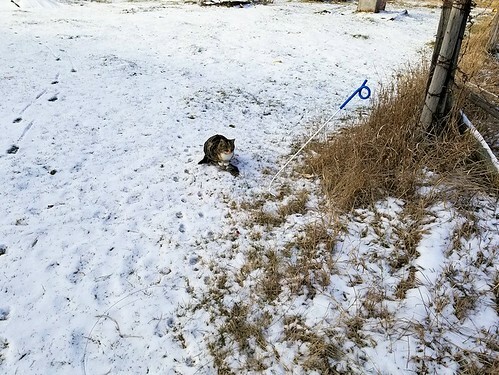 At the end of the row of spruces, near the feeding station, there is a patch they’ve been pawing at for a while, now, and it’s getting quite big. I think, in the process of clearing out that area and taking out the bottom branches of the spruces, I also gave them better access to something in the moss that they like. I can’t see what it might be, though. 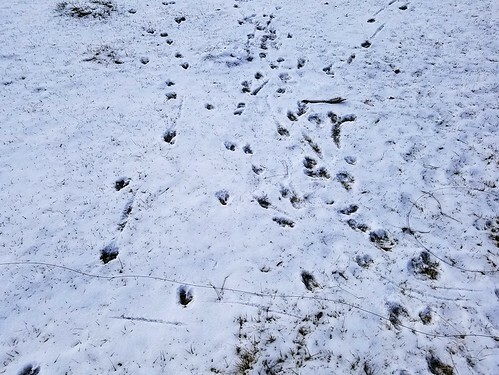 While continuing around the yard and by the garage, I noticed deer tracks coming from the barn towards the yard, so I followed them. Then I noticed something odd about one of the wire holders for the renter’s electric fence at the gate. It looked bent. Heading over, I started to find wire. So I started gathering it up. Here is most of it, along with the holder that is bent the most. The other one turned out to be bent, too. The wire is still running through it. 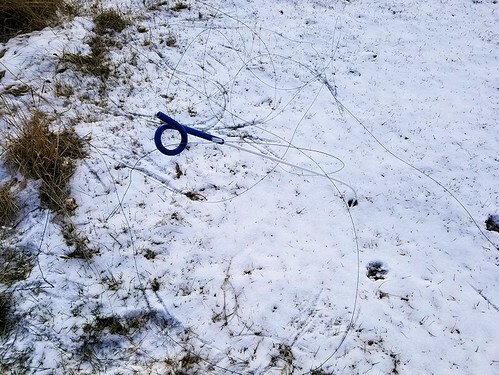 Considering how much wire got dragged into our side of the fence, I think it may well have broken loose right at the solar battery area. Which is almost at the other end of the fence. There were plenty of tracks, showing exactly where they came through! The fence wire would not be easily visible, and with the cows moved out for the winter, the electric fence probably doesn’t even have electricity running through it right now. The deer probably didn’t see it to jump over it, and would not have felt any shock to cause them to back away when they touched it. 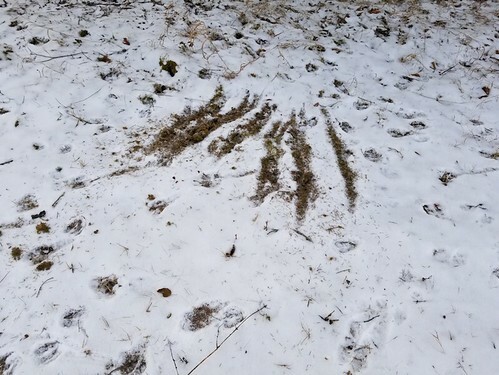 We like the deer coming around enough to put up with any damage they do; there isn’t a lot. But this is a bit more than just digging up the yard. The wire should be fine and just need to be re-attached. I believe those wire holders are new, from the last time the cows broke through. I know the renter likes the deer, too, and this sort of thing is just what we have to live with when living around here. I just called to let him know about the damage. With no cows here, there’s no hurry to fix it.